Weekend race roundup – updated! Hi folks, we had many PGRCers running area races this weekend. What a great turnout! Did we miss you? Did you run a race and want to get your time posted? Send the results to president@pgrc.org. Thanks! And these are just the folks we saw at the race, so if you ran please let me know and I’ll add you to the finisher’s list! Also a big two thumbs up to beer garden volunteers Dan Grasso, Margaret Lo Hing, Cassandra Logan and Jason van Brecht. Thanks guys! As a bonus, a few of us hanging out/cleaning up after most of the crowd cleared got a treat – we met Catherine Ndereba, an Olympian and the top female winner, who finished in 1:13:17! (No wonder she has been called the “greatest woman marathoner of all time.”) She was very sweet and put up with a lot of pictures from curious/geeky running fans, including US! From left: Me'Lissa, Margaret, Catherine, Darnell, Kim and Cass. Many PGRCers were out racing a variety of distances this weekend- Parks Half Marathon, Frederick Mile, and VHTRC’s Women’s Trail Half Marathon- among others. Did you race? – Post your race report here. Here are some results. Saturday 9/25, Sweetgum Picnic Area at 8:30am. Volunteer with REI and Greenbelt Park for trail maintenance. Arrive early at 7:30am, get in your run, and then volunteer at 8:30! How convenient it is. Let us know here if you plan to volunteer. Let’s see if we can get at least 10 PGRC volunteers. Question of the week: Walk breaks? Do you ever walk during a race or training run? 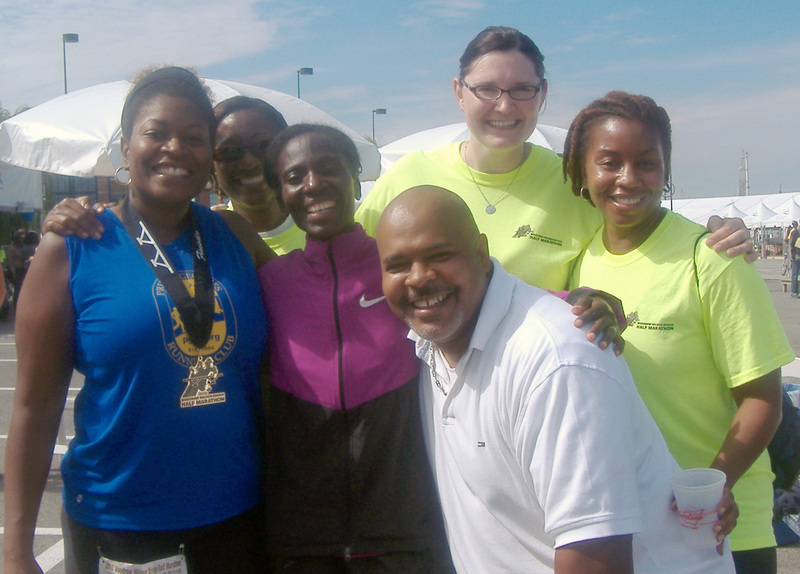 Lavonda and I completed the Annapolis Ten Mile race on Sunday. We had such different experiences that we agreed to write this “point-counter point” article for the running community. We will lay it out there and let you, the reader, be the judge of whether you should run this race. First, I’ll state my point of view, then followed by Lavonda’s. Valerie’s point: I LOVE THIS RACE! The A-10 has two attractions for me: first, a 7:30 a.m. start time, and second, free beer at the end. Plus its one of the few races where you really earn your premium prize because you won’t get it until you cross the finish line (no picking up the T shirt at packet pickup before the race.) The race is challenging and consists of a lot of hills and a run over (and back) the Severn River Bridge. (also called the Naval Academy Memorial Bridge). About 5,000 runners enter the race, and registration fills up quickly. It is sponsored by the Anne Arundel County Striders. It has become my favorite race because it is challenging and known for its hills. Those who know me know that I LOVE HILLS (and bridges.) The Severn River Bridge is no joke, and the incline is steep and appears to go on forever. My fastest time in this race was in 2005 when I set a series of personal records (PR) and signed up for private coaching. In 2005 I ran the A-10 in 1:51, and had previously run the women’s only MORE half-marathon (two times around Central Park) in 2:31:31. The MORE half-marathon is two times around Central Park and consists of rolling hills. This year I finished the A-10 race in 2:05 and I was somewhat disappointed with my time, hoping to at least run my previous PR. But that was not to be. At the starting line, Lavonda and I chatted with Bertha, the founder of Fitness Heights, a new running club in D.C. Bertha was much faster than the two of us so we knew that we would not see her until the finish line. She finished the A-10 in 1:28 and was pleased with her time. Today’s run started out pleasant enough, not oppressively hot. But it was hot, and I drank water up until reaching the starting line. And we were off! The race steamed up quickly. Mile 1 was interesting as I got swept up in the pace of the crowd. Miles 2 and 3 ventured through downtown Annapolis and the crowds yelling and cheering were a welcomed boost. A funny thing happened between Mile 3-4. I was running along and a sister runner fell, tripped over an uneven dip in the sidewalk and twisted her ankle. I stopped to help her up, along with another runner. That was a sobering moment and I became super careful about my steps and stride. The hills became steeper, at least it felt that way, and for a couple of minutes I lost my rhythm. Surprisingly, I had to walk up part of the bridge between Miles 3-4. After the bridge I started to get my “mojo” back and got back into the swing of things. Between Mile 5-6 I saw the perennial favorite, the guy from the University of Notre Dame. At a large colonial home on the right side of the road, there is a guy who is blaring the Notre Dame Fight song. He is outside wearing the Notre Dame hat, yelling and cheering along with his wife. It is always a sight to see, and I am a sucker for familiar sights to see during a race. And if you have ever seen the movie “Rudy” you can’t help but chant as you run by him “Rudy! Rudy! “ It was a priceless moment and truly great fun. Aside from that, the course of the run was beautiful: scenic, historic (running through the Naval Academy community) where the neighbors all came out and yelled, screamed, sprayed water hoses, offered orange slices, and encouraged each and every one of the runners. There is a one-mile straightaway from mile 8 to mile 9 that is just unbelievably fast and I picked up the pace. I felt the best between miles 5-9. At Mile 9, I passed another welcome sight, my husband Dan, who was cheering us on and snapping photos. Then we entered the Naval Memorial Stadium, which means that the race ends on hill, which seems to go on a bit. At the end of the race there was the free beer, a rock band playing during the post-race festivities, food (bananas, bagels, water, and Gatorade) and lots of vendors selling running-related wares. I missed the free 35th Anniversary hand towel as I was slightly euphoric and disoriented when I crossed the finish line. But I did cross it and ran straight for the free beer. Which, of course, was as good as I remembered from last year’s race. I would encourage everyone to run the race, at least once. It is a physical and mental challenge, and we all need to push ourselves every now and then. Yes, the A-10 is hard. I read someplace that it is one of the “ 10 most challenging 10 mile races in the country.” But the “hard” is what helps to make it fun. If it were easy, everyone would do it. Next year, I hope that we can get a team from PGRC to train and run this race. LaVonda’s Point: Think twice, maybe even thrice, before running this race. Valerie and I finished the A10 two days ago. Frankly, I needed to allow a couple of day’s distance to ensure my response wasn’t negatively influenced by the proximity of this grueling race. Now, to those of you who have run marathons and ultras I might sound like a whining pansy. But, be that as it may, I truly hated this race. Let’s take it from the top. I signed up months ago at the urging of my formerly very dear friend Valerie. She went on and on singing the praises of the infamous Annapolis Ten Miler. “I just love this race!” she wistfully exclaimed on more than one occasion. “It’s soooo much fun!” she beamed. Unfortunately, mile after mile I couldn’t seem to find the fun. It was at 7:30 in the morning. I’m naturally an early riser and have been known to go out for a training run at 5:00 AM. But, driving to Annapolis from Prince George’s County at 5 AM was a completely different matter. There were hills, hills and more hills. They even threw in twice across a monstrous man-made hill in the form of the Severn River Bridge. I almost didn’t enter this race after hearing Val say “I just love hills.” I was still traumatized by the last Club Challenge in Columbia. But, when she noticed the look of horror on my face, she quickly added, “Oh, but it’s nowhere as hard as Columbia.” I entertained the fantasy of improving my time. I finished the Club Challenge in 1:42. After all, I had a lot more mileage under my belt. It was hot as Hades! That fact is that took the difficulty level way beyond the Club Challenge. No luck improving that time. I finished in 1:48. I was never able to find a rhythm. Halfway through the race my calves started to burn. My hamstrings started to tighten; I started feeling a slight twinge in my left knee. It seemed like everyone passed me. I passed exactly two people (and one of them passed me back). Annapolis was picturesque and inspiring to many. Unfortunately, I’ve discovered I can’t seem to notice any of that when all of my efforts are focused on simply putting one foot in front of another and surviving until the finish line. With each mile I really tried to get into the spirit and find the fun. But, it stubbornly eluded me until the finish when I was able to savor the guilty pleasure of sipping a beer at 9:30 in the morning. The most significant upside is what I learned about myself as a runner. I do love running. But, I’m more of a social runner. The most disheartening aspect of this race is that I didn’t have anyone to talk to and I couldn’t listen to my iPod. Conversation or music is what gets me through my training runs. Correction: I did have a quarter mile dialog with a very nice guy, Rich. We both chuckled after hearing a course marshal refer to the bridge as an “itty bitty hill.” Rich and I talked each other up that bridge somewhere between miles eight and nine (almost). We both had to take a walk break right before reaching the peak. Fortunately, Rich signaled it was time to pick it back up after reaching the top. Thanks, Rich, wherever you are. I’m not a competitive person. But, in-spite of that, I find it impossible to adopt the “no big deal – run your own race” mentality that is Valerie’s mantra. It really, really bothered me that everyone was passing me. I need get a lot more serious about my training. I need to stop avoiding hills like the plague. I also need to do some consistent speed work so I can get a lot faster or I need to develop a lot more humility. Maybe some day I’ll find the fun in this race. Unfortunately Sunday was not that day. The lesson for me is that I need to go back and devote some serious time and effort to speed work. It worked before and will work again. I think that I can train to improve on my previous race time, and I am up for the challenge. And, who knows? Maybe Lavonda will change her mind and run the 2011 A-10 along with some more PGRCers!